Author’s note: Roughly 15,000 healthcare professionals gathered in Anaheim, California, last week for the premiere science event for my organization, the American Heart Association. A group of high school students attended, too, hopefully enticing some of them to become the next generation of leaders in the fight against heart disease and stroke, the top two killers in the world. Here are the details, as first reported by American Heart Association News. Ariana Alonso decided years ago that she wants to become a neurosurgeon when she grows up. Now a sophomore at Valley High School in Santa Ana, California, she took the first step by joining a curriculum track that trains students for a career in health care. Another step came last week. Ariana was among 275 students who attended the American Heart Association’s flagship science event in its fight against heart diseases and stroke. It’s called Scientific Sessions and it’s held every November, drawing nearly 15,000 people from around the globe and from all aspects of the cardiovascular world. The meeting always includes “Students at Sessions,” a half-day program for local high school students. With Anaheim playing host this year, teenagers came from 10 Southern California high schools. The program began with a welcome from Dr. Kathy Magliato, a cardiothoracic surgeon whose memoir inspired a recent show on NBC. She told stories of her own high school days, like her job as a janitor and the time she got caught starting a food fight. She also described challenges she’s overcome, such as being a woman in a male-dominated field and balancing a career and a family. 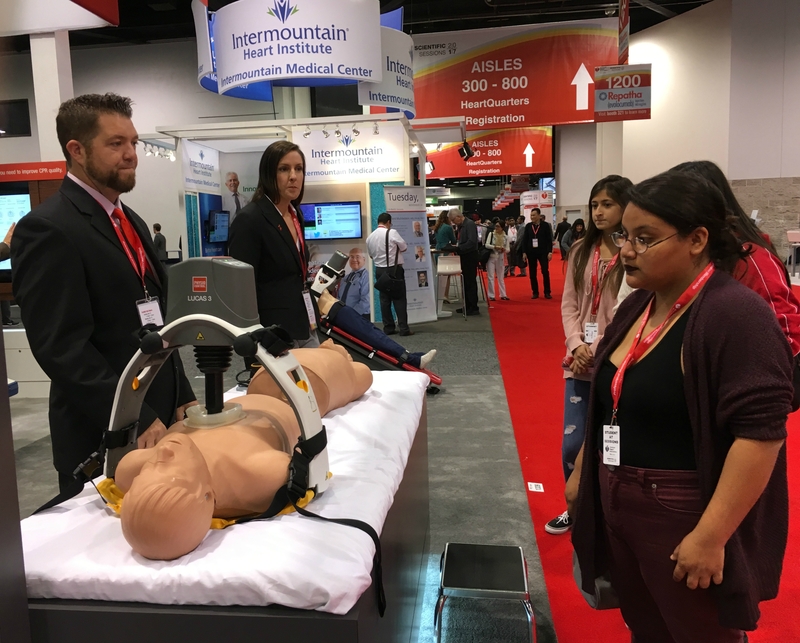 When the students divvied into small groups and headed to the exhibit hall floor, American Heart Association News joined Ariana and several classmates to experience the event with them. Early on, Ariana smiled and said she was the right person to follow. Ariana was 7 when she suddenly became ill. Vomiting came first. Soon she couldn’t move. Doctors struggled to find the cause. A brain scan found the culprit: a tumor. A surgeon removed about half, then stopped. More cutting, he feared, could cause other problems. Chemotherapy and radiation would have to tame the rest of her cancer. A decade later, it has. What’s left of her brain tumor “is asleep right now,” she said. She gets tested every four months to make sure it’s staying that way. Ariana spent more than a year in the hospital, then was home-schooled. She’s a year behind her age group. The youngest of six kids, Ariana aims to be the first in her family to attend college. The exhibit hall is enormous. To first-timers, it’s often described as the ultimate science fair. While many areas are set aside for presenting research results, most of this space is used as a trade show, of sorts. It features row after row of booths run by makers of devices, medications and more. Ariana’s group walked wide-eyed through it all … until they were jolted by a loud “ka-thunk” sound. It came from a machine giving CPR to a manikin. The presenter showed how to adjust the rate, depth and duration of the chest compressions. Ariana saw another booth using virtual reality headsets and rushed to be the first one in her group to try it. The demonstration was a reminder that accidents happen so anyone taking blood thinners should use the kind that can be reversed. “This is so much funner than being in a class right now,” one of Ariana’s classmates said. The group walked slowly in front of a display with about a dozen human hearts. Dr. Saroja Bharati, a cardiac pathologist, took that as her cue to lead the girls through the collection. As Bharati showed off normal and infected hearts, peeling back layers to show where disease entered and the damage it caused, Ariana drifted from the front to the back. She said the smell got to her even though there was nary a whiff of formaldehyde. Back in the ballroom, Ariana and friends joined about 50 students getting trained in Hands-Only CPR. The lesson started with a video of a teenager describing how she saved a man’s life while a group of adults stood watching helplessly. The instructor asks what to do when encountering someone who is unconscious. Ariana suggests calling 911. Next come the chest compressions – hard, fast pushes to the center of the chest. The goal is to press down 2 inches, more than 100 times per minute, until help arrives. Each student sat on their knees over a manikin. It clicks when they push to the right depth. As with many kids, Ariana struggled to push deep enough, often enough. “It’s harder than I thought,” she said. At day’s end, every student received a CPR Anytime kit featuring a how-to DVD and a manikin. The afternoon session began with everyone getting a boxed lunch. Magliato returned to moderate a pair of sessions with different panels of experts. Some were doctors, others researchers. Some specialized in heart disease, others in stroke. Regardless, each had a unique story of their personal journey to this stage. Between all these tales, nearly every student likely found something relatable and, perhaps, inspirational. For instance, one woman grew up in a remote area of northern Canada battling dyslexia and a speech impediment. She left her parents at a young age, then became the first person in her family and the only member of her high school class to attend college. She tried getting by on $10 a week – money earned by selling painted clothes – but became malnourished. She returned home hoping for mercy from the parents she’d spurned. She got it. She’s now a cardiac cell biologist. One man hated going home each day as a child because of violence in his house. Anger and rebellion became his nature, too; having attention-deficit disorder made it worse. He became quite familiar with the inside of the principal’s office. In 10th grade, he discovered people made a living studying the brain and decided that’s what he wanted to do. He only got into one medical school, but that was all he needed. He now leads a stroke project for the National Institutes of Health. A man from China talked about faking an illness to get out of a PE class in high school so he could hear a Nobel Prize winner speak. That inspired his life in science. Not that it’s been easy. He got rejected by UCLA for graduate school. Now? He’s a professor there. Two men followed their fathers into medicine. One fell in love with it while going on house calls with his dad. The other got hooked reading books by Albert Einstein and Isaac Newton during a year in bed after falling from a ski lift and shattering a leg. Yet another man decided to become a doctor at age 10 when a blood disease killed his brother. Magliato talked about the disappointment of not getting into medical school on her first try. She also described the first time a patient died and the “full metal jacket” she put over her emotions, a façade that crumbled when another patient – a baby – died in her arms. “Now I care deeply for patients because I know I can withstand the pain,” she said. When it was time for questions from students, Ariana was first to the microphone. The biggest lesson for this girl who dreams of going from brain patient to brain surgeon?